Just as you thought you got a grip on Facebook, LinkedIn and Twitter tools, the world of social, visual and educational content is about to flip again…faster than you can imagine. The content industry is about to become a whole lot more innovative and more democratic very quickly. And the next big break is propelled from the visual world. Chris Anderson of TED says the rise of web video is driving a worldwide phenomenon called Crowd Accelerated Innovation — a self-fueling cycle of learning. But could TV also become a social sharing platform? And dare I say an educational sharing platform? What if you could tweet and contribute real time information to an interview during a live current affairs show, or cooking show? What if you could contribute educational information to a TV documentary in real time? Last year, Technology Review, published by MIT, named social TV one of its 10 most important emerging technologies that could “change the world.” And Wired Magazine UK editor David Rowan this month named social TV one of the top six tech trends to expect in 2011. In the US they already made baby steps in Social Television through mega-popular events like the Oscars and MTV Music Video Awards. Social TV broke water with live Twitter and Facebook feeds sliding across the bottom of TV screens, letting viewers chat, comment and react to live shows. One of the most popular yet conservative networks – the BBC is taking Social TV very, very seriously. They recently exposed their work on a new beta social version of their popular on-demand iPlayer (an Internet TV and radio service for videos and TV shows). So, while Google is taking its sweet time to develop Google TV, the BBC is leaping ahead into Social TV land. What’s really surprising is that In April 2010 alone, they received 123 million iPlayer requests – these are massive numbers for an on-demand broadcast service. The advantage of iPlayer is not just its web access, but its way in across all operating systems, mobile phones – in download and streaming form. You’d think the next obvious step is to create a new social network service, wouldn’t you? But the BBC doesn’t want to “create” their own social network … they prefer to send out smoke signals to third-party social sites. 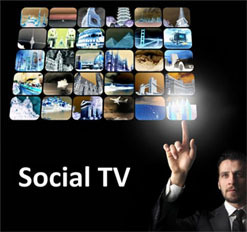 Social network TV – TV is missing out right now on any real social integration that can enhance content. Yet “a social TV experience,” to some extent is already happening through the swarm of “TV tweets” generated by viewers while watching TV. So it seems, TV can be completely transformed through true social integration. If I’m watching a documentary for example, I want to be presented with a social window (completely optional) that offers me the latest tweets for that program, comments, discussion but most importantly of all – user generated content. Imagine if during or after that documentary or true story you can access people’s real photos and videos from the event. The experience becomes a whole lot more real and active – it’s no longer about passively consuming what someone thinks you should. TV in the cloud? Since the cloud is the talk of the day, why not leverage it to locate our own content and personalized online experience from any PC, tablet or smart-phone? Cisco is already “sky high” into Cloud TV development: At the recent CES 2011 show it exposed its Videoscape platform. Videoscape aims to do nothing less than combine online content and digital TV with social media and communications applications in the cloud. Love to see how this one evolves. “We aim to enable a new architecture tailored to making video content available across any network or device,” CEO – John Chambers. Some of this is a bit “zeitgeisty” but feasible. Everything is moving towards becoming more social, more cloud-based and more disruptive. So… enough with accusing me of being a couch-potato…hand over the smart remote and let’s start some serious TV chat.